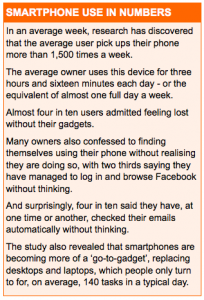 A recent Tecmark study of 2,000 smartphone owners revealed some interesting facts about smartphone users. For instance, did you know the average user reaches for their device at 7:31am each day? From that point on, they regularly check their social media accounts (Facebook, Twitter, Instagram, etc] and access their personal and business emails and texts excessively throughout the rest of the day – up until the time their head hits their pillow — only to wake the next morning to repeat the whole cycle once again – à la Groundhog day. Most of us have become so reliant on our smartphones, we actually utilize them to carry out a staggering 221 tasks per day, according to this report. In an average week, the research indicated that smartphone owners access their devices more than 1,500 times to complete the various the tasks noted above. This accounts for the average user actually using his or her phone for three hours and sixteen minutes a day. 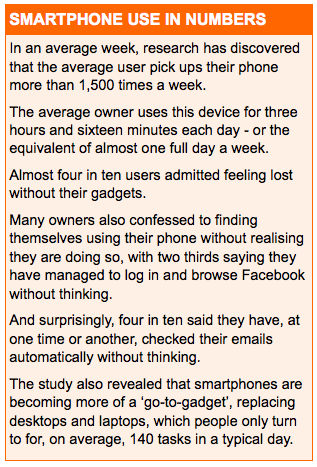 Which, in turn equates to a staggering one full day a week using our phones. So why is this important for VoIP? For those who are either currently using or thinking about accessing a VoIP [Voice over Internet Protocol] office technology service via their smartphones, this will provide you with a competitive edge in the business world. How? For one, you’ll experience less missed calls and/or hang-ups. How many of you have experienced an office voicemail that’s gone unnoticed or unattended to, much longer than was necessary. So much so, that a potential client or business partner ends up checking out the competition? Instead, with your smartphone at-the-ready, it’s less likely for that scenario will play itself out. 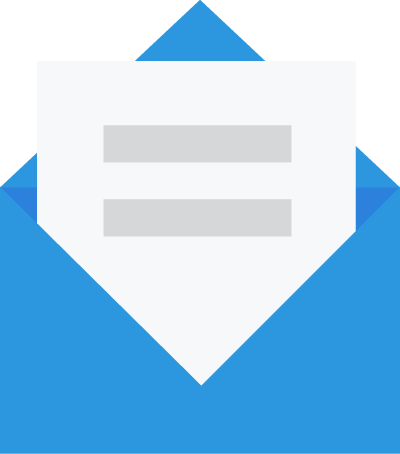 Since [according to the Tecmark study] we are checking our smartphones approximately 1500 times per week, those voicemail messages – uploaded to an office email account and a VoIP service synched to our smartphone – have a greater chance of getting noticed and attended to on a timely basis. POT or the ‘plain old telephone’ is quickly becoming a dinosaur. That’s why VoIP is so extremely important. It incorporates telecommunications into emerging technologies and rides the wave of innovation as the tech industry invents new ways to leverage it. Telzio continues to stay current and at the forefront of innovation, when it finds it can add value to their customers’ VoIP experience. An example of this playing itself out is currently being reviewed. Telzio is intently following the news that Facebook’s much ballyhooed WhatsApp messaging service will soon be rolling out an update to allow users the ability to call WhatApp contacts over VoIP. It’s Telzio’s intent to make that service available to its users when that new feature becomes a reality. For technology available now, users will be happy to know that Telzio just launched its text messaging and faxing features, and Telzio’s free mobile app for iPhone and Android allows users to make and receive VoIP calls on their mobile devices, powered by the company’s business phone system and all the features behind it. Telzio users can view and send text messages through the Dashboard. Outbound text messages are charged per message depending on your plan. Inbound texts will continue to be free. You can find all the rates at telzio.com/prices. Inbound and outbound faxing is also available for Telzio users. To send a fax, go to telzio.com/fax and upload the document through your web browser. You can get a dedicated fax line to make and receive faxes, or send faxes through our no-reply line without purchasing a plan. VoIP is evidence of the business community’s interest in unified communications across multiple devices. Companies no longer want to pay for different brands of communication that don’t interface with each other and their devices. Today, they want their smartphone interfaces like web conferencing and telephonics working together in tandem to optimize their operations quickly and efficiently – at least 1500 times per week!